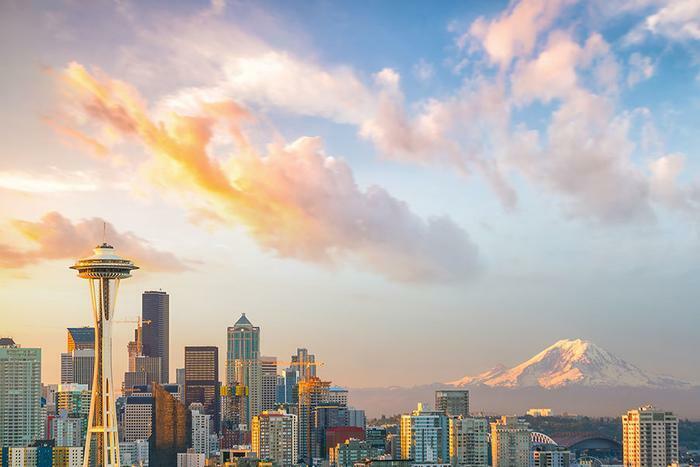 Seattle, the largest city in the Pacific Northwest, is home to tech giants like Microsoft, Amazon, Facebook, and Google, bringing in thousands of professionals traveling for business. Many fall in love with the city and linger a while, for pleasure. The city is located between Lake Washington and Puget sound, giving it a famously damp but temperate climate. To the east are the Cascade Mountains, to the West are the Olympic Mountains, creating a scenic backdrop to this bustling city. Seattle remains a popular tourist destination, in part for practical reasons. Its famous Space Needle–a souvenir from the 1962 World's Fair–is an observation tower that provides a view of the city and surrounding area from 520 feet up. Recently, the Space Needle became a portal for visitors to access some of Seattle's main attractions. The "See It All" portal is a place to get tickets for and information about 11 tourist destinations, including Chihuly Garden and Glass, Museum of Flight, Woodland Park Zoo and Argosy Cruises. “With more than 55 years in the tourism industry, the Space Needle and its staff have naturally become the go-to locals for visitors from around the world,” said Eleanor Bradley, Director of Marketing for the Space Needle. Visitors can also get advice and recommendations from the locals about what to see and do while in the city. The Seattle Center Monorail is another futuristic artifact from the World's Fair. Still in operation, it transports visitors from the area around the Space Needle to Westlake Center in downtown Seattle. It's a fun way to begin a sightseeing tour, with the monorail reaching top speeds of 45 miles an hour as it weaves through buildings. Before boarding, however, visitors might want to drop in on the Museum of Pop Culture and the Pacific Science Center, both of which are close by. The Museum of Pop Culture documents important moments in music, science fiction and pop culture. The exhibits cover everything from the history of indie video games and horror films to Nirvana and the NFL Seahawks. The Pacific Science Center explores galaxies in a planetarium, displays colorful creatures in the tropical butterfly house, and has a number of family-friendly, interactive exhibits. Throughout the fall, Seattle's events and festivals draw locals and visitors alike. Now through November 12 the annual Earshot Jazz Festival presents a series of concerts around the city. A unique element of the Earshot Festival is that it brings top jazz performers into collaborations with local audiences and artists, including talented students. The 29th Annual Best of the Northwest Art & Fine Craft Show is November 10 through 12, featuring more than 100 of the area's top artists. Seattle is also famous for its food culture, with its emphasis on fresh ingredients. After all, the national trend of "eating local" largely began in the Pacific Northwest. Well known Seattle chefs like Tom Douglas, Ethan Stowell, and Renee Erickson bring their creative flavors to the city, while all manner of beverages are locally produced with a special passion. Seattle is served by Seattle-Tacoma International Airport, located approximately 13 miles south of downtown Seattle. It is served by all major domestic airlines, as well as some foreign carriers, and is a hub for Delta. You can also get to Seattle on Amtrak with trains conveniently stopping at King Street Station in downtown Seattle.